Entrance: 1 day ticket € 6 / 3 days ticket € 10, tasting glass offered. Show reserved for people over 18 (proof required). To taste the visitor must buy packs drinks tokens. Only the event’s official glass may be used for beer tasting. Tasting will cost between 2 and 4 tokens – brewers base their prices on the characteristics of each beer. 9.30am > 6pm : Trade members only (by invitation or online registration). Trade members registering online must produce proof of status. Plane : Dinard airport (from Londres, Jersey, Guernsey) services by Ryanair, Aurigny – Rennes airport (several direct flights from French and European cities).. Bus : services by Ilenoo. Saint-Malo offers a good choice of accommodation. 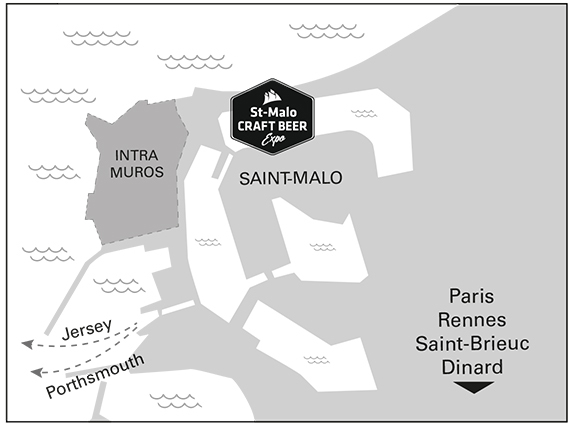 Saint-Malo Craft Beer Expo invites you to take advantage of the Privilege Offers of our partner Hotel Mercure Balmoral. Located near the TGV station of Saint-Malo, just 10 minutes walk from the exhibition center and the intra muros city, this location is ideal for enjoying the festival and Saint-Malo.